Kurt and Johanna Rottensteiner: This is our land. Kurt and Johanna are almost embarrassed to take us on a walk through their vineyards. It’s a sort of South Tyrolean modesty; their passion is in the work they do, not in the words they say. And their days are filled with work, for this land has belonged to Kurt’s family for many generations. In fact, when they had the chance, Kurt and Johanna initially decided to leave. Only when you can choose something does it earn value. Here, there is immeasurable value. We are in the land of Pinot Nero, in the township of Egna to which the tiny town of Mazzon and its 80 hectares of vineyards belong. Five of these hectares belong to the Brunnenhof farmhouse, which has belonged to Kurt’s family for over a century. Four hectares are planted with Pinot Nero and one with Gewürztraminer, with some space left over for Lagrein and Monzoni bianco – a 1930s hybrid of Riesling Renano and Pinot Bianco. Kurt and Johanna made Eva from Manzoni bianco. It’s a young, fruity white with fresh apple aromas, named in honor of the first woman and, more importantly, their teenaged daughter Eva. Johann, Eva’s brother, grimaces good-naturedly when we ask if he wishes he had a wine with his name on it. Both brother and sister carry the air of knowing their future belongs here, even though their parents encourage them to consider all their options, such as studying abroad. Kurt and Johanna know that something holds more value when one returns to it by choice. 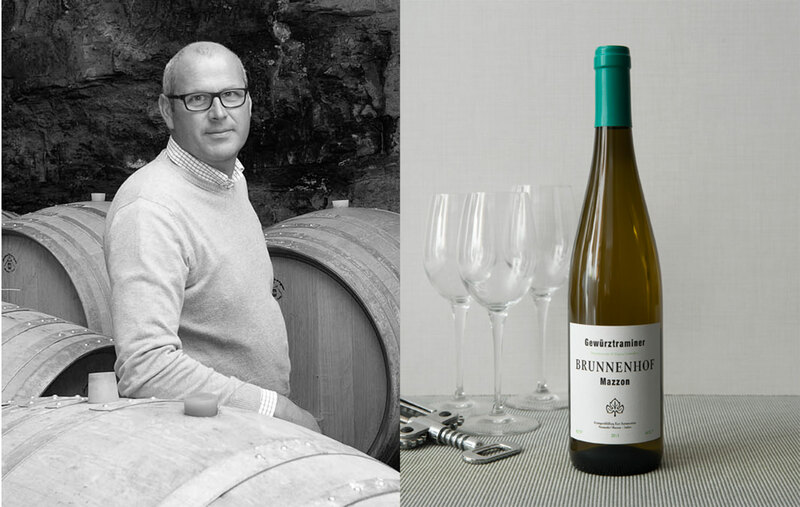 With the latest harvest, they were happily surprised to learn that Gewürztraminer wine is considered almost equal to Pinot Noir, according to critics. Aromas of lavader, rose, vanilla, apple, pear, and quince escape from the glass. The wine has a a citrusy acidity that isn’t afraid of aging, our sommelier says – with time, it will demonstrate the wisdom of a mature woman. Curious as to how that would taste? Set the bottle aside in a temperature controlled cellar for several years, and let us know – if you’re able to resist drinking it now!